The colour of the feedback is the first indicator of how good it is. If you have used smiley of 5-star questions in your feedback form, their average is taken and this denotes the colour of the feedback, using traffic light colours from red to green 1). At the top right you can see the date and time, so exactly when the feedback was given and also for which location/survey it was. 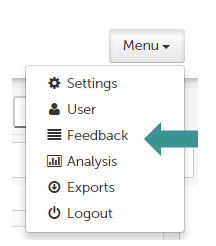 to the right of that information are the symbols needed for you to process your feedback 2). The background information on the left tells you which language was used 3). Then all the customer's feedback is displayed 4).